I get on a weird kick every so often where I will make the same meal about a dozen times in a week, typically tweaking the recipe until I find a flavor combination that I love. This time wasn’t quite the same as I made the same dish repeatedly, but just couldn’t bring myself to alter the original recipe because I loved it so much. This post is about my most recent infatuation: burgers. Burgers are the standard American staple, made everywhere and by everyone. There are already millions of variations and specialties, some going so far as to even include things like gold flakes . Ground beef is not a normal component of my diet, but I do love a good burger (and so does pretty much everyone besides my wife). A simple beef patty on a roll with some cheese is usually all that I require, but I’ve been craving something just a little different lately. And so began a little experiment that I think came out very well in the end. It is remarkably tasty and very easy. The secret to this burger is really two-fold: the compote topping and the bread. Now, I’ve mentioned before, I’m really a snob when it comes to bread and rolls, having literally grown up in an Italian bakery and being exposed to “the good stuff” before I could even speak. Cottony kaisers and waifish white bread are not welcome at my table; nor should they be at yours, I might add. Our family’s mastery was in the hard roll, and we were revered for them. It was not uncommon for there to be a policeman directing traffic in front of our bakery on Sunday mornings. Globes of golden goodness abounded, with a slightly crunchy shell and a beautifully puffy yet doughy interior. Many people would buy a dozen for home and another just for the car ride. I kid you not, this same story has been told to me ad nauseam by countless people over the years. I need to stop before I get too nostalgic. Suffice it to say, I haven’t had a decent hard roll in years. Not long ago I heard that my local grocery store started baking their own hard rolls and they were pretty good (not quite what I grew up with, though a valiant attempt I will say). 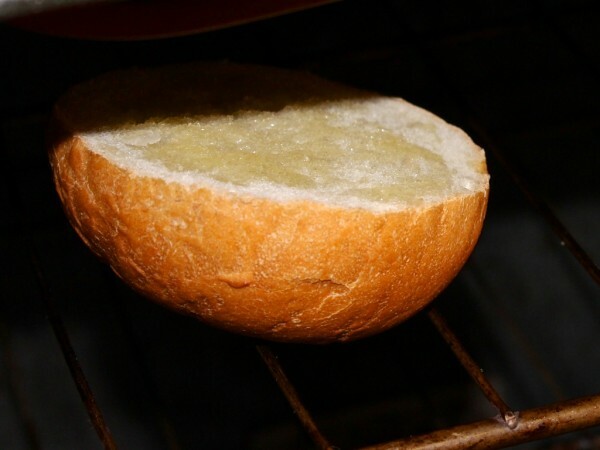 So, in the tradition of toasted burger buns, I went a little further and smeared garlic butter on the bun before tossing it under the broiler. These would become the foundation of my burger, now it was on to finding the right toppings. Do you like bacon and onions on your burger? I do! Having them the standard way is good but I wanted something slightly different, so after a little googling I found the answer: Bacon Onion Compote! 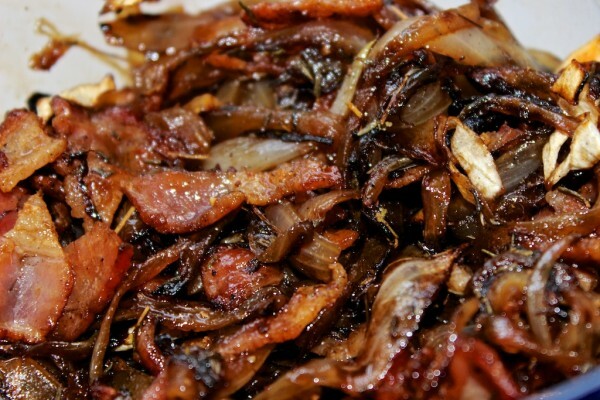 It’s simple- caramelized onions, chopped bacon, spices and balsamic vinegar. It’s sweet, savory and really makes the burger pop. This component takes the most time to make thanks to the baking of the bacon and the caramelizing of the onions, but it can be made in advance and it keeps for quite a long time (if you don’t eat it all out of the jar immediately). Take this mixture and toss it in a food processor to pulse for a few seconds and you get a proper compote texture. Personally I skip this step as I enjoy the texture of the bacon and grilled onions together and I find it goes better if you decide to put cheese on the burger. Speaking of cheese, I have a tendency towards American but I have a feeling Bleu would be an excellent alternative. I suppose I should also mention the beef. While it’s the defining ingredient of a burger, I don’t find the specifics to be all that important, with one real exception; fat percentage. You want the right ratio, which is typically in the 15-20% zone. Any less than that and you’re going to have a very dry burger. I usually use 20% and mix it with some salt and pepper before forming 1/4 lb patties. Preheat your pan, cast iron is of course my preference as always, on medium-high and season the burger with salt and pepper just before placing it in the pan. The general guideline is 4-6 minutes per side, but all stoves are different so I find it easiest to take a look at the underside of my burger with a spatula after about 5 minutes. If it has a decent char I’ll flip the burger, if not then I wait a little. Deciding when it’s finished is actually very simple; press the top with your finger. If the indentation stays then your burger is not cooked through yet. If it pushed back a little then it’s finished. If it doesn’t move at all, congratulations you have a hockey puck! (The smoke and burning smell should have tipped you off to this one.) Once your burger is finished cooking let it sit for a couple of minutes. This is the same principle as any meat you cook, the rest period allows the meat to redistribute juices and will keep your plate from looking like blood soup. 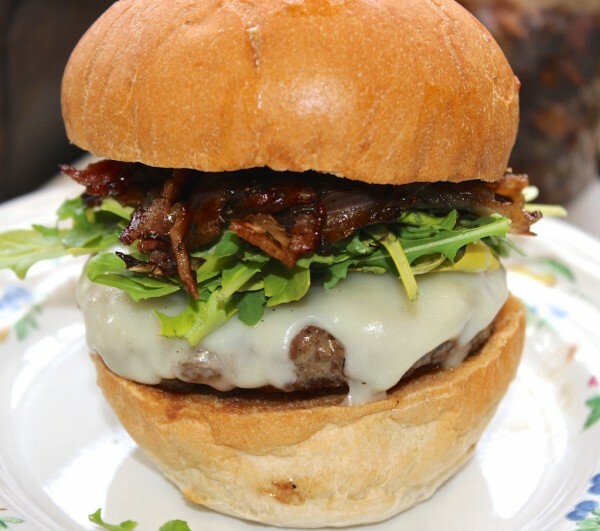 For just a dash of color and flavor I like to top my burgers with some arugula. It gives it a little peppery crunch and balances out perfectly with the rest of the ingredients. Assemble your burger and enjoy! I split the recipe in two as you will see below. One for the bacon onion compote itself and the other for the assembled burger. That way you can save the compote individually if you want. So you are really getting 2 recipes this time! Place bacon on a parchment paper lined baking sheet and place in cold oven, then turn oven to 400 degrees and bake until golden brown(approximately 17 minutes). Set aside to cool. Heat a cast iron skillet to medium high and pour in the oil. 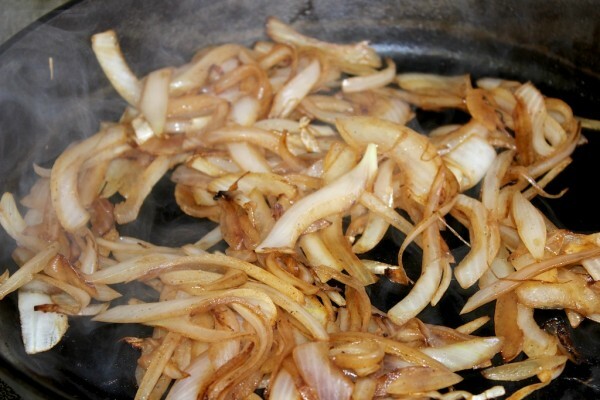 Add onions and stir periodically until caramelized(approximately 15-20 minutes). Toss in chopped bacon, thyme, salt and pepper and cook a few more minutes. Transfer to a bowl and set aside to cool. Toss Balsamic vinegar with mixture. (Optional) Pulse mixture in food processor for a spreadable, more jam like consistency. (optional) 1 slice cheese of choice. Cook on one side until there is a good char. Flip the burger and continue to cook. Assemble burger with your choice of toppings and enjoy!